Here lies the progress of the 3rd build of an LM3886 based chip amp. A fair amount of pictures, too much writing... you're all in for a good time! The amp pictured is fairly simple, and is based on the LM3886 IC by those wonderful people at National Semi, which does all the dirty work, and is used as a giant powerful opamp, more than capable of driving speakers. The datasheet has a schematic, which can be used to build a working amp using this chip. I think it's quite a nice introduction to DIY amps. An amp for the n00bs to build, I guess! It also has all sorts of protection built in. It's almost impossible to blow up. The chip 'only' delivers up to about 50W RMS continuous in to 8 ohms, and 68W in to 4 ohms, depending on the supply voltage. Though the output power vs supply graph does seem to show that in to 4 ohms it can manage nearly 90W. This is a 0.1% THD rating, however, and not a pointless 10% THD rating. It can apparently manage 130W peak, though I don't know how long peak is really for. They seem to use very honest ratings in the datasheet though, so at a guess I might say it is capable of delivering the peak power for 'a longer time' than your average amp? "The specs are quite sucky, why bother?" I have actually found it quite fun messing about with these chips. What possessed me to try building the first one? I can't even remember now. I guess it's just one of those things I have always wanted to do, and when I found out that there was a chip which gave decent power, I went for it. I've certainly learnt quite a lot doing it, and redoing it. Despite it being "just" a chip amp, I find it actually sounds quite nice, and even though it is (relatively?) low wattage, it really is surprisingly loud, especially in a medium sized room. To give an idea of the volume, I have actually thought about going for a pure class A amp, something in the region of 5W to 10W, and this is with a set of older Celestion 7 speakers, which are rated with a 88dB (IIRC) sensitivity at 1M. I'm sure if you weren't told that the sound being produced was all done by a simple, cheap IC, you just wouldn't really know. People seem to claim that these chips sound quite 'tube like', to which I can't really comment as I have never heard tube gear. They have been described as having a magical midrange, which I think I might actually agree with. Whether it's because I was really listening hard after building it, I don't know... There's no doubt that I could have bought some commercial gear instead and have done with it, but trying to build an amp has kept me nice and busy! It is probably not for everyone to try, despite my claims of simplicity. In most cases it does involve going near mains voltage, so it is potentially dangerous to mess with, and it really has tried my patience at many points, when things just don't seem to want to go according to plan. Where did I start off designing this amp? The PCB, which holds all of the components, is drawn out from a 'schematic', which sort of describes, in the simplest of simple terms, what connects to where in an electronic circuit. 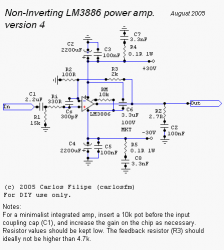 For the actual amplifier part, I have pretty much just used the schematic from the datasheet now. 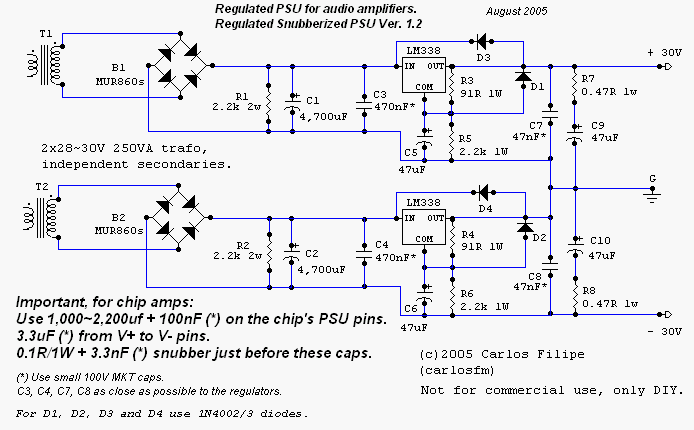 I started off using a schematic drawn by someone known as 'carlosfm', which I found at DIYaudio.com. But this time around, I have removed some stuff from that which I *think* might well be un-necessary. This would be heading in to a subjectist vs objectist war, so I don't think I will go any further than that! Heck, the regulated supply part of this amp (the two LM338's chips at the edge of each PCB) might even be unnecessary really. I am keeping those for now though, as you will see. 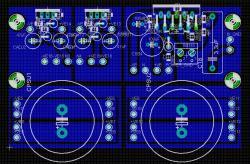 For the power supply I am using a schematic again designed by 'carlosfm'. But, again, have virtually ended up with a schematic from the LM338 datasheet. As mentioned, it's not exactly this schematic any more. But this is the PCB that I have come up with this time around. It should be noted that, although it may seem it, I still do not really have much of an idea what makes a technically good PCB design. I'm not claiming it to be a good layout at all. I am just happy that it seems to work! I have used the 'toner transfer' method to get my PCB design on to a copper board. I printed out the artwork, at home, on my InkJet, and then took it in to my local Staples store to get it photocopied. It is important that the PCB artwork is printed using a laser toner. This can be by a laser printer directly, or it can just be photocopied from any old source, as I did. The photocopy is laid on to the copper board, which should be nice and clean, and just ironed on much like a t-shirt transfer, I guess! There is a papery residue still left on top of the toner, which is why it looks white-ish, and not black. This doesn't really seem to affect anything though. After ironing my artwork on to the PCB, it then needs to be etched to produce the circuit. This is a quick shot of the board during etching. The lovely brown horrible looking stuff is called Ferric Chloride. This is the "etchant". The Ferric Chloride removes the exposed copper from the board. You should be able to figure out roughly how it works from the picture. The orangey bits you can still see are the copper that the Ferric Chloride hasn't yet removed. You can see that it *has* removed some copper, which forms the 'tracks' / actual circuit. The Ferric Chloride, in theory, can't remove the copper which is covered by the laser toner. Ferric Chloride stains almost everything, and is an acid... so care should be taken here. It needs to be kept at about 40-50C to etch quickly, but if it gets too hot releases some nasty acid...vapour type stuff, which would be far from pleasant. So, don't pour boiling hot water straight in to this stuff! I used another tray underneath with boiling water in to heat it up. The etching probably took about 5 to 10 minutes, and heating it up as I did is a bit of a pain, but it works eventually! Since the Ferric Chloride solution is a really dark browny blacky colour, you can't see the board in it to check it's progress. I just kept lifting the board to check on it. When it's done, it's time to get it out of the Ferric, in to some newspaper, and run out to the garden and blast it quickly with the hose pipe. It has removed the copper and formed the traces. The board then needs to just be quickly sanded to remove the toner / paper and reveal the copper that's left behind. My first attempt went a bit wrong. I printed out three boards, but didn't get a picture of the failed one. I don't think I ironed it for quite long enough, and when I went to peel off the paper a fair amount of toner was still attached to the paper! If this happens, there's no need to worry really as it's a pre etching problem. Just sand it off and iron on another copy (if you have one). Here you can see the etch of my PCB's this time around isn't exactly perfect, and I think this might be down to the photocopy contrast being a bit low. You can see it is a bit patchy / dotty in a few places on the board. All of the traces, however, are 100% intact regardless of this, so I continued. To stop the copper from oxidizing, and to attempt covering up the patchyness, I covered it all in a thin layer of solder. It takes a little while, and the picture makes it look a bit rubbish (due to flash and lighting I guess), but it does work quite well and does infact still look pretty good. I think I do prefer the look of a copper board, and this can apparently be done by spraying over the board with a lacquer. I tried this, but found that it didn't seem to work too well. I may have just done it wrong, it may have just been a 'bad' lacquer, I am not sure! I would recommend first trying it on some sort of test board, prototype board or something perhaps, to see if you can make it work. I drilled the holes on the PCB's with a dremel and a 0.9mm / 1.0mm drill bit. They are quite small bits! I used standard HSS bits, and although they certainly do seem to wear down rather quickly drilling through FR4 (fibreglass) PCB's, they do still manage well enough and will be fine! If you get paper based (I think it's paper?!) PCB's then HSS bits should get through that no problem at all. Here's one of the amplifier channels nearly completed. Is it the left or right channel? I don't know! All of the components are soldered in / on to the board. There is pretty much just a couple of wires missing at this point. To the right in this picture is the other channel sitting incomplete, waiting until I test out the first one before I start putting it all together. I figured it would be a little bit of a waste if I build them both at this point, and they don't work. It would involve a fair amount of tedious de-soldering. In order to get the size of the boards down for this project, I decided to use some SMD / SMT components. These are the really diddy components that you often find scattered all around computer motherboards and such. I found them fairly hard to solder with just your basic soldering iron, but it is certainly possible if you try hard enough. The resistors especially, even 0805 packages, are crazy small, but I managed it... just. You can look in to 'reflow' soldering using some paste and a 'microwave oven', if you want to get it really perfect. The larger silver parts are 100nF SMD 'PEN' caps, these were somewhat easier as they're quite huge in comparison. Huger than I expected them to be. This is the point where PCB mistakes seem to have come in to play. I realised, after re-simulating to make sure the SMD resistors would be OK to use, that for the voltage regulators one of the resistors would actually need to be about rated at about 0.5W. The little SMD resistors are only 0.1W, so I had to tack a normal sized resistor under the board in it's place. Thankfully, this didn't cause any major problems. I also forgot that the PCB's would be right next to each other when mounted on the heatsink, which meant that there would have been a possibility of the -ve rail from one channel coming in to contact with the 0v rail of the other channel and shorting. I didn't like them being insanely close to each other. It must have been my lucky day, as there was a simple fix for this too. I just dremelled some of the copper away from the edge of one of the PCB's. I could have moved the input wire around to the edge of the board instead, which would have made it a tiny bit neater I think. I can't really fix this now, but I am sure it won't really matter too much. How is it going to be mounted to a heatsink? Screws! In the first two designs I had mounted all of the IC's to some old CPU (PII / PIII) heatsinks by drilling all the way through the heatsink, and using a standard bolt and nut. I don't like this approach much, so this time - because I want it at least somewhere near 'perfect' - I have bought a 'proper' heatsink. The base is 10mm thick Aluminium, and in short it's just a beast. I am just going to drill some small holes, not all the way through, and use plain screws to attach the IC's to the heatsink. I tested this out with some old rubbish heatsinks, and it seemed to work quite well. This picture is just showing the screw through one of the IC's holes. After consulting with Silverfox, he concluded that it was a 3mm (standard?) thread, even though I somehow measured it as 2mm. Yes, I am actually *that* amazing. It's a 'Floppy drive screw' apparently, which is 5mm long. Since this is the amp that I want to get right, Silverfox offered to get me some really nice looking allan key style screws, button head, polished mirror finish, along with some nice mirror finish washers to go with them, from his Father (Father Fox?). Apparently though, 5mm in length is pretty rare, so they will actually be 8mm.. hence the need for washers. They aren't currently in any of my pictures at the moment, as the post is screwing (no pun intended!) around and they haven't actually arrived yet. But thanks very much to the Fox's for supplying me with them! Having said that, if I lived within 5 hours of you, I would commuting to your house everyday to watch you work on these projects. I find this stuff fascinating, and even more-so your ability to just jump into it and figure it out as you go. Your homemade boards are starting to look darn-near professional. I can't wait to see some more progress on this thing. Thank you for your kind comments! :thumbs-up: The boards are certainly a lot better than the first two attempts, and I can see a certain level of "professionalism" in them somewhere. Believe it or not, I also have very limited electronics skills! There are still so, so many things I don't understand / confuse me. There is no way I could have designed a discreet amp myself, but I hope to learn enough to get to that point some day. I think a headphone amp might be a good place to start for people who aren't quite as insane as myself They'll run off batteries for a long while I think, so it's pretty safe to mess around with It would also be pretty cheap I imagine, so if it goes wrong you haven't lost out on too much money wise. You raise a good point though. The PCB is drawn out from a 'schematic', which sort of describes what connects to where. 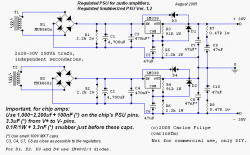 For the actual amplifier part I have pretty much just used the schematic from the datasheet now. I started off using a schematic drawn by someone known as 'carlosfm'. But this time around, I have removed some stuff from that which I *think* might well be un-necessary. This would be heading in to a subjectist vs objectist war, so I don't think I will go there! Heck, the regulated supply part (the two LM338's on each PCB) might even be unnecessary really. I am keeping those for now though, as you can see. 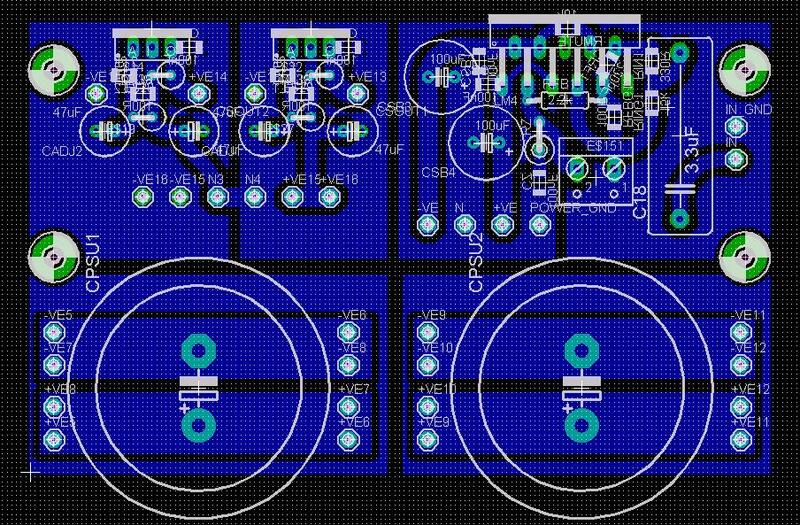 For the power supply I am using a schematic again designed by 'carlosfm'. 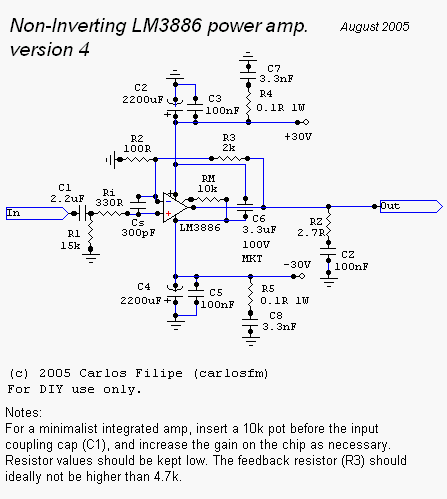 But again, have virtually ended up with the schematic from the LM338 datasheet. I think you should have a go at building one of those CMOY headphone amps. There's a guide there on how to assemble one too if you like to start basic (nothing wrong with that at all! it is quite sensible really). Then maybe you could, instead of following the guide, read the schematic and opamp datasheet (just for the pin out at this point really) and sorta... learn how to read a schematic and make it in to a circuit. I even found that I seemed to learn a fair bit from doing just that. There seems to be something strangely rewarding about building a circuit that produces sound! Wow, its been a while since I ventured into one of your threads since you realised the joy of soldering . Haha. Yep, I still enjoy occasionally eating solder for breakfast. I haven't seen you around for a fair while! Good to see that you're still about! I use Eagle, which can be found at http://www.cadsoft.de/ . I have become quite accustomed to the PCB part of it, but I still can't get to grips with the schematic drawing bit though. It is supposed to be REALLY good if you can manage to get around the schematic bit too though There is a free version available, and from what I remember the only restriction is you can only use..... up to 2 layers maximum..... and for new files the board size is restricted to 100mm x something mm. But you can still open and print any file, no matter how many layers / the size of it. Just can't actually draw outside of the restricted area, if you know what I mean.